Mini Australia’s latest out-of-home campaign is tapping into a combination of geographic and contextual data sets in order to deliver more dynamically targeted content to consumers. The latest campaign, which has been developed in partnership with Vizeum Melbourne and Posterscope, will run across digital out-of-home sites across the country and utilise specific data sets, such as location, traffic, time of day and weather conditions, to more contextually target creative to passing consumers. The mix of out-of-home sites has an emphasis on proximity to airports and stadiums. The content being used is designed to showcase the vehicle’s new range of connected benefits such as in-car, real-time traffic updates, a concierge service and optional union jack brake lights. A spokesperson told CMO nine creatives are scheduled to run across 48 sites, varying according to a total of six triggers.The campaign is running from 1 July to 31 August. Mini Australia national marketing manager, Alex McLean, said bringing creative concepts to a large digital format is a step change for its campaign efforts. “Mini has historically enjoyed being a quirky brand, so it is excellent to be able to incorporate unique creative that really demonstrates the USP of these vehicles, ultimately influencing drivers at timely moments,” he said. Posterscope business director, Lauren Farquharson, said research showed message recall is significantly higher when dynamic advertising is used, citing Liveposter’s The Dynamic Difference research as a case in point. According to those findings, dynamic creative can have lift average brand equity by 27 per cent, consideration by 32 per cent and advertising spontaneous awareness by 101 per cent, resulting in a 49 per cent increase in overall effectiveness. “The launch of Mini’s connected model locally was a great opportunity to demonstrate the versatility of digital out-of-home, providing a platform for synergy across other digital media,” she said. Vizeum group client director, Sophie Mylne, said triggering consideration is a key moment in the consumer journey for Mini. “Given ROI is such a huge focus in market right now, it’s great to be able to make our digital OOH work that little bit harder for Mini,” she added. 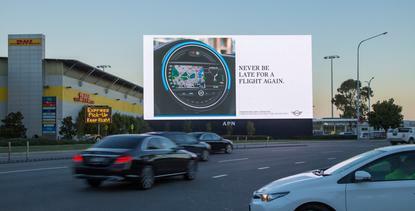 On top of the out-of-home campaign, Mini's media mix also includes WeTransfer, interactive video on mobile; advertising via Virgin Inflight Entertainment, cinema collateral, display advertising with The Guardian and CarPortal activity.